The chakra balance process can cause some major releases of blocked or imbalanced energy from a persons physical body. Some people could get emotional some could experience headaches and some might not seem to go through anything at all out of the ordinary. The human body is not made to house negative energy. If a persons mind holds onto a negative thought for a long period of time, this can turn into a physical symptom of illness or dis-ease. Clearing chakras can actually remove negative energy from the body. When this happens, the negative energy can release itself in the form of nausea, diarrhea, emotional release, night sweats, menstruation for women or some people don't seem to go through anything out of the ordinary. Chakras are incredible energies to work with and being able to clear and balance the ones that are out of whack, can be such a humbling experience. Fast track your healing abilities and fully realise how you are affecting your chakra energy and how you can change it all. Bring your entire body back into complete energetic balance by clearing and recharging your own energy centres and those of your loved ones or clients. 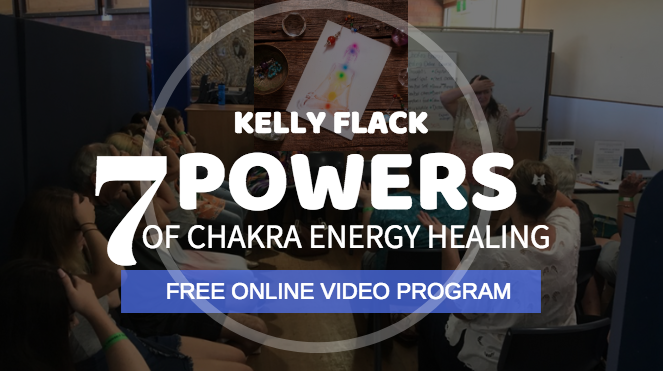 During this comprehensive online course, Kelly will give you the entire process and a clear map so you can stay on track and achieve chakra energy healing for yourself and others in the shortest possible time.